The Battle of Poltava was a gigantic battle fought in 1709 between Sweden and Russia. This dramatic background has inspired Elk Studios to create a dramatic slot machine that’s quite different from their normal light-hearted style of Taco Brothers or Bloopers. Besides just the dramatic graphics and music, Elk Studios decided to give the game another dramatic touch: big wins. The game features fewer wins than your average slot machine, but when the wins come, they are bigger. Overall the game’s payout percentage is 96.4%, making it one of the highest paying games in 2017. The game is really a sight to see. It has two unique bonus modes: Flames of War and Marching Reels. 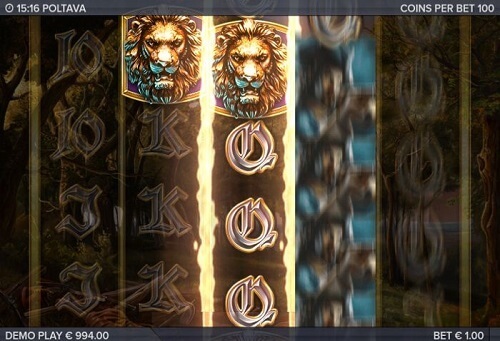 Flames of War is a free spin bonus mode, where you can get more spins by getting the lion symbol on the reels. The never-before-seen Marching Reels see your troops advance toward through the reels. To activate Marching Reels you need four identical combat arm symbols on the same payline. While Poltava can be played with your PC and Mac, it was designed to be played on a mobile device, like an iPad, iPhone, Android & Windows phones and tablets. You’ll really feel this while playing, as the game is easily as good on mobile as any of our other mobile slots. Note that setting your wager works a bit differently in Poltava than in most other games. Here each spin costs 100 coins. Simply choose your coin size from the lower left hand corner of the game to set how much you’d like to wager with each spin. By the way, we weren’t kidding about the big wins – Poltava’s maximum win is 180,000 coins! Speaking of betting, each game developer has their own signature feature. Elk Studio’s signature feature is Betting Strategies, which alter your bet size automatically according to a preset strategy. If you are one of the players who like to adjust your bet sizes during gameplay, Betting Strategies are aimed exactly for you. Poltava comes with half a dozen built-in Betting Strategies. You can choose a strategy that ups your wager after losing or one that keeps your wager a certain percentage of your funds. To choose you strategy tap on the money symbol of the lower left hand corner. Betting Strategies work especially well with auto play. To activate auto play in Poltava, hold down the spin button.